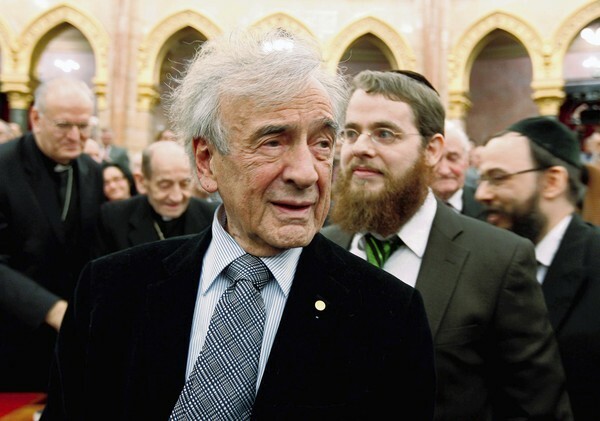 After reading this article, I immediately checked out Carolyn Yeager’s website Elie Wiesel Cons the World to see what she has to say about this new honor for Elie Wiesel. I found a video which explains the whole story of Elie Wiesel in great detail. The video starts out with the sound of an old fashioned typewriter as the keys hit the paper, typing out the URL of the website. I love it! The sound of the typewriter keys brought back a flood of memories; I was alive during World War II and I saw the news reels of the liberation of Bergen-Belsen and read about the liberation of Dachau. Yet I didn’t get interested in the Holocaust until many years later. My lack of interest in the Holocaust was nothing unusual, as the video on Yeager’s website points out. The article in the Chicago Tribune also points out that there was very little interest in the Holocaust as late as 1960 when Elie Wiesel’s book Night was first published in English. After the war, [Elie Wiesel] worked as a journalist in France for Yiddish and French publications. The noted French writer and Nobel laureate Francois Mauriac urged Wiesel to write his Holocaust memoir, and Mauriac “went from one publisher to another,” said Wiesel, to persuade them to take on Wiesel’s book. Why was the world slow to recognize the book’s value? “Maybe it needed — the world itself needed maybe a whole generation for readers to realize that they must know something more” about the Holocaust, Wiesel said. As a person who was alive and well between 1945 and 1960, I can tell you why no one was interested in the Holocaust during that period. The years after World War II were the best of times. During the 1950s, everyone was extremely happy to be living during peace time; no one wanted to re-live the war. I was writing and selling magazine articles during the 1950s, but not stories about the Nazi concentration camps, which would not have been of interest to very many people at that time. There were thousands of Holocaust survivors in American during those years, but they were keeping their mouths shut and hiding their tattoos. I lived in Germany for two years after World War II, but I didn’t bother to go to see the former Dachau camp. When I went back to Germany for the first time in 1995, I didn’t go to see the Dachau Memorial Site. The Holocaust did not become as popular as it is now until many years later. If only I had anticipated the Holocaust mania, I could have written a novel about Auschwitz and Buchenwald and become a millionaire. Many people have urged me to write a fake Holocaust memoir, but I think it is too late for me; there are too many fake memoirs on the market. I was one of the first to put the information on the Internet that Elie Wiesel could not have been in the famous photo taken in Barrack 56 in Buchenwald on April 16, 1945 because, by his own account as written in his book Night, he was in the camp hospital on that date. You can read that page on my website, which I updated 3 years ago, here.